Rajasthan and the Rajputs are inseparable entities defining one rich cultural heritage. The indigenous fashion of Rajasthan owes a lot to the Rajputi attires that are uniquely inspiring with its remarkable features like the Zari works, Gota patti embroidery, Zardosi embroidery and Kundan works. The Shahi Rajputana collection from TheHLabel imbibes a lot of inspiration from the Rajputi culture. Interestingly, the variety of garments in the collection celebrate the salient features of Rajputi designs in art and techniques of garment making. The designer sarees available in the collection feature pure Rajasthani flavour and inspired art from Rajputi traditions. As it is well-known from Indian history, Rajasthan has a rich heritage of kingships and shahi culture, the grandeur and poise of which translates into its garments and fashion too. Featuring online designer sarees in the ethnic variety, Shahi Rajputana collection presents a wonderful assimilation of traditional elements. It is time for you to chose to adorn yourself in some wonderfully vibrant garments in ethnic wear by buying designer fashion sarees from the Shahi Rajputana collection. Let us look at some garments in the collection. Here we present the best tribute to Rajputi tradition with this ethnic saree set. The set has a pastel pink blouse with mirror work on the neckline and scattered buttis all over, paired with a pastel pink saree. The saree has hot pink border and the digital print of Rajasthani woman painting on the pallu. A well-crafted blouse in the set is made in raw silk and the saree is made from georgette. The best way to style it is by wearing gold studs. Here’s an interesting ethnic garment combo. It features an earthly rust coloured sleeveless raw silk blouse with mirror work on the neckline and hand embroidery on the back. It’s paired with an olive green georgette saree having digital print on the pallu. The ethnic saree set can be best styled with gold chunky jewellery. This saree set features an interesting combination of brilliant colours. The set has a pastel blue full sleeved raw silk blouse with mirror work on the neckline. It has hand embroidery on the sleeves and has tasselled laces in the back. 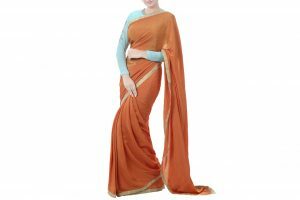 It is paired with an orange natural crepe saree having beautiful mirror work. When you wear this saree set, style it with pearl earrings for the best look. Summery looks are yours in this combo of an orange blouse and ombre saree. The blouse has mirror work on the neckline and scattered beads all over it and beautifully set laces with tassels. The paired saree has mirror work on the pallu. Style it with statement gold earrings. This enchanting combination has a red blouse with mirror work on neckline and lotus hand embroidery towards its waist. It’s paired with pastel blue saree having red facing and mirror work on the pallu. The garment is crafted in raw silk. To style it up, wear a choker necklace. Here’s an ensemble to fall in love with. It has a pastel pink raw silk blouse with mirror work on the neckline and lotus machine embroidery all over. The blouse has a zipper in the front. It’s paired with pastel blue cotton silk saree with pastel pink border. Dangling earrings can give the attire a unique look.